You and your team are trapped in a seemingly normal room and have one hour to escape. Use your detective skills to find clues, piece together hints, find the key, and escape the room! For the latest updates on ticket availability, future games, and much more, sign up for our newsletter! Tickets are not sold at the door and must be purchased in advance. Once booked, tickets cannot be refunded or rescheduled. Ticket reservation closes at 11:59pm the night before the game, so please plan ahead! Games may be subject to cancellation if the minimum number of players is not met (refunds will be issued). Except that you and 10 other people are locked in, can't remember how you got there, and can't seem to find the way out...Upon closer inspection, it seems like there is nothing normal about this room. Welcome to The Strange Room. Our basic room! A good challenge for those new to escape games. 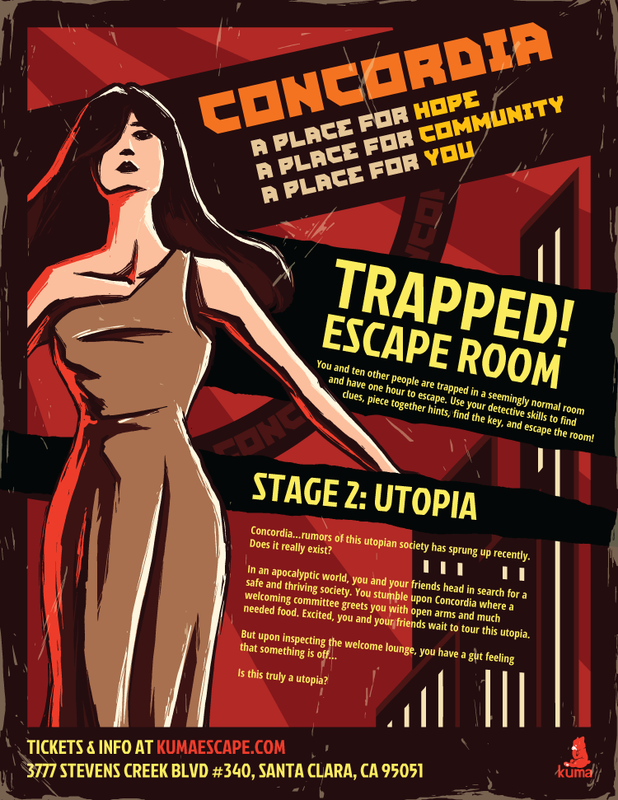 Concordia... rumors of this utopian society has sprung up recently. Does it really exist? Big thanks to the 553 teams who played this room and the 34 teams (6%!) who escaped successfully. Team Brothers and Sisters had the fastest time of 44min and 30sec! Today is your high school senior trip! You and your friends have been looking forward to this all year, but unfortunately, you are all stuck in detention. Big thanks to the 400 teams who played this room and the 72 teams (18%!) who escaped successfully. Team Frogzilla had the fastest time of 43min and 28sec!